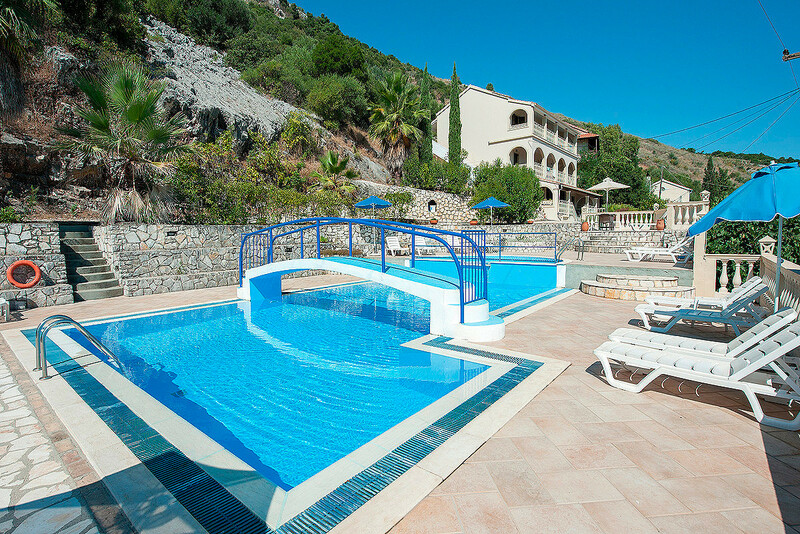 The Andreas Pool Complex is located in the very heart of Kassiopi on the north east coast of Corfu. It has an appealing atmosphere of peace and seclusion despite being close to the centre and all amenities. The centre of the village is a very short walk away and the beautiful harbour of Kassiopi is approximately 5-10 minutes. Bars, restaurants, supermarkets and all other amenities are within walking distance. Located across two buildings, the complex comprises 8 studios and 4 two-bedroomed apartments, all with either terrace or balcony. The studios can accommodate up to 4 people with use of a camp bed, and the apartments can accommodate up to 5, again with the use of a camp bed. All apartments have free WiFi and air conditioning is available at an extra charge, payable locally. Extra beds can be added also at an extra charge. The beds are camp beds and are only suitable for children. Local Stay Tax must be paid locally at 0.50 per day. Kassiopi is the largest village in the North East of the island and is unique among Corfu’s resorts in having both a very picturesque setting and surroundings and a fair amount of history. Despite changes occurring each year, mainly due to tourism, the beautiful harbour area is totally unspoilt, is lined with many cafes and tavernas but still retains its Greek fishing village atmosphere. The ruins of an old fortress on the headland overlook the harbour and a small footpath leads you up to the castle, which is currently being restored. The headland is surrounded by shingle beaches and little coves and the clear, turquoise waters are very safe for swimming. This part of the island is particularly pretty and many people return year after year to relax and admire the stunning views. Over the years many people have even bought properties here, or have invested in old derelict houses and restored them for use as holiday homes and villas. Some of these people have these houses solely for their own use or they rent them to holiday companies and travel agents. The owners of these houses come out to Corfu regularly to check and maintain their properties and often spend many weeks of the summer here. Many even find it beneficial to bring their work with them from the UK. Laptop computers and the Internet have enabled many people to work in this way. There is also quite a large British ex-pat community now in Kassiopi and its surrounding areas. The Greek population of Kassiopi numbers around 650. Living here permanently now are also around 20 British women who have settled here after marrying local Greek men. A couple of these women met their husbands elsewhere but the majority came on holiday as tourists or holiday reps and ended up staying. Most of them also got married here in the local church and had traditional Greek weddings. Consequently there are now a large number of bilingual children living locally, whose mothers are British. The village itself offers much to the visitor. Everything is very central, including shops, bars and restaurants of which there are numerous offering many different types of cuisine from Greek to Italian. Many of the bars also offer snacks and tourists really are spoilt for choice. During the evenings it is possible to find many lively bars but it is also possible to find much quieter bars to relax in. Most restaurants are open all day and start their days by offering breakfasts and snacks, then on to lunch and of course dinner in the evening. During the summer season, all the restaurants stay open till very late and often till the last diner leaves. The mood in Kassiopi is very relaxed and no one will ever rush you. Good news for families is that children are welcome everywhere. There is never the feeling, often felt back home, that the children should not be in the bar or restaurant. This is one of the reasons Kassiopi has become such a good family resort because the visitor and all the family can truly relax and enjoy themselves. Apart from eating out, a break from the beach often means a visit to the shops, of which there is no shortage. A wide range of products are available and you will find almost anything you need, even if it is just cheap holiday mementoes or quality clothing and other goods, such as jewellery, accessories, leather, lace and wood products. In the village there are also several supermarkets catering for all of your daily needs and that of your family. They do not have everything you would expect to find at home but everyday essentials such as milk and dairy produce, baby products i.e. nappies, toiletries etc should not be a problem to find. The main supermarket has a butchers section which brings a daily supply of fresh meat and poultry. Meat is not pre-cut, minced and wrapped as you will find at home, you simply tell the butcher what you need and he will prepare it in front of you. In Kassiopi, as in most places around Corfu, you will find that most shop assistants speak English so you should not encounter any problems anywhere. Bakeries: Kassiopi is lucky enough to have two lovely bakeries. One is tucked away on the left hand side on the road just before the main square, and the other one is on the right hand side, almost opposite. Bread of all descriptions is baked daily and the fabulous selection of cakes and pastries will leave you spoilt for choice. During the summer there is a wide choice of ice-creams and ice-cream cakes. If you are celebrating something special you can order cakes for any occasion. Pharmacies: The local pharmacy, situated on the right hand side of the road just after the main Kassiopi square, stocks most things you may need should any minor illnesses occur during your stay. The staff are very helpful and English-speaking and will give you any advice you may need. Check the sign on the door as the pharmacy usually shuts during the siesta hours but is always open in the mornings and evenings. It may be worth checking Sunday opening hours as occasionally they may stay shut. However, during the summer season they generally open daily. Doctors: There are two, English-speaking doctors in Kassiopi. One is Dr. Antonis, whose surgery is situated on the right-hand side of the road coming into Kassiopi. It is set back off the road so you will have to look out for the surgery sign. Dr. Katerina’s surgery is situated along the passageway behind the pharmacy. Public Toilets: There are no public toilets in the village but you are always welcome to pop into any of the bars and use their facilities. Rarely do the bar owners mind you doing this but if you feel a little uncomfortable, maybe you can stop for a quick refreshment as well. 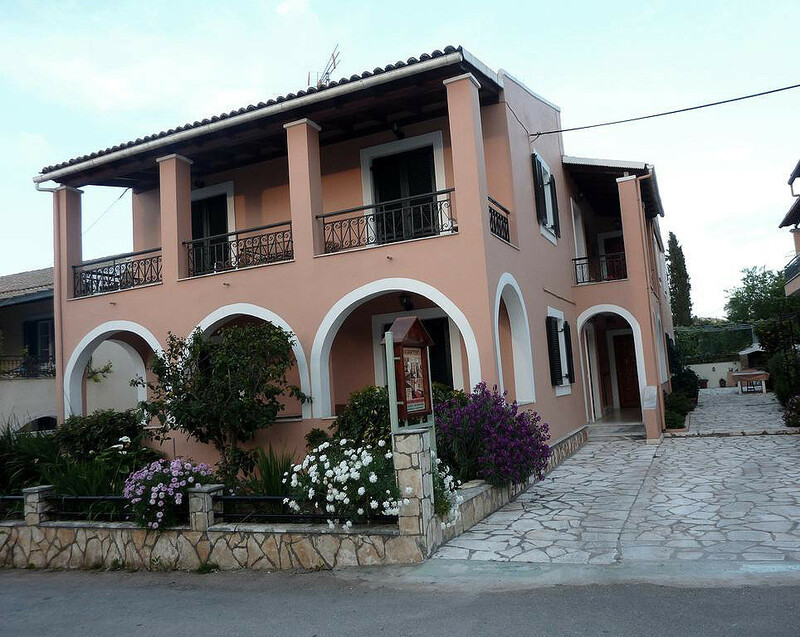 The accommodation is very varied in and around Kassiopi. There are many apartment blocks scattered around the village, some of which are of a high living standard and unfortunately some that are pretty much uninhabitable!! Some people come on holiday with well-known tour operators, whom they trust, only to arrive to find their holiday ruined by the conditions in which they are expected to live for the next week or two. Many people are now discovering that it is very easy to book their holidays via the Internet directly with us at The Travel Corner. Situated on the right hand side just before the main square in Kassiopi it is the best and most reliable tour operator in the north of the island. Many people book for next years’ holiday while they are actually here on holiday, during which time they can even request to have a look at the properties available. Siesta: As previously mentioned, siesta times are roughly between the hours of 2pm and 5pm. In Kassiopi, things quieten down a bit, the children’s playground remains shut and the afternoon becomes a nice, relaxing time of the day. A lot of people adopt the Greek way of life whilst on holiday and have a little nap. During the heat of the summer it’s a good chance to get out of the sun for a couple of hours. Foreign Currency Exchange: Changing cash is very easy in Kassiopi. Just pop along to our office at the main square and you can change any currency at the latest bank rates. Usually, there is a small commission charge of 2%. There are also Cash Machines nearby for withdrawing cash. Safety Deposit Boxes: For peace of mind, you can also store your personal belongings and passports etc, in safe deposit boxes at the office, again at a very small charge. Excursions by Boat and Coach: It is often very tempting to laze by the pool or on the beach every day, but there are so many beautiful places to see on Corfu that you really should make a few days to see them either by taking some excursions or by car. Children are easily bored and there are some excursions available which would fill many hours of fun for the little ones. We offer many trips by boat and coach and if you pop into the office you can buy a ticket for any one of them. Children aged 4yrs – 12yrs go half price and infants are free. If you decide to take the car hire option, which is a great way to be able to do your own thing without being part of a group, you really should think carefully what sort of car to hire. The roads in many areas of Corfu and particularly the northeastern area where Kassiopi is situated are very windy and steep. Therefore, it is highly recommended that you hire cars that have all the latest safety standards available and very importantly, fully comprehensive insurance. If you are not too familiar with the roads in Corfu it is not wise to accept a car that was cheap to rent but is not of a high quality and safety standard. Excel Cars, based at our office, have the best cars for hire and the prices include fully comprehensive insurance with no excess to pay. The prices are very good and very competitive but you are always assured a car in immaculate condition and perfect working order. Child seats are available on request. If you are coming back to Corfu in the future, bookings can be made on this website and cars can be delivered to the port or airport. Instructions will be given to you regarding pickup of the vehicle. If you arrange to pick up your car at the airport you will be met by one of our representatives (unless alternative arrangements have been made), who will have all the necessary paperwork ready and ensures you spend as little time as possible waiting around in the arrivals area. This is a great way to cut out the stress of transfers to and from your accommodation. Alternatively, you may prefer to arrange a taxi transfer with us and have the car delivered to your villa or apartment. If, at the end of your holiday you are delivering the car back to the airport or port, you will be informed of the drop-off point. Having a car for a few days is a perfect way to explore all the different places in Corfu and the surrounding areas of Kassiopi at your leisure. Kassiopi’s four main beaches are called Kalamionas, Pipitos, Kanoni and Bataria and are all situated around the headland below the ruins of the fortress. 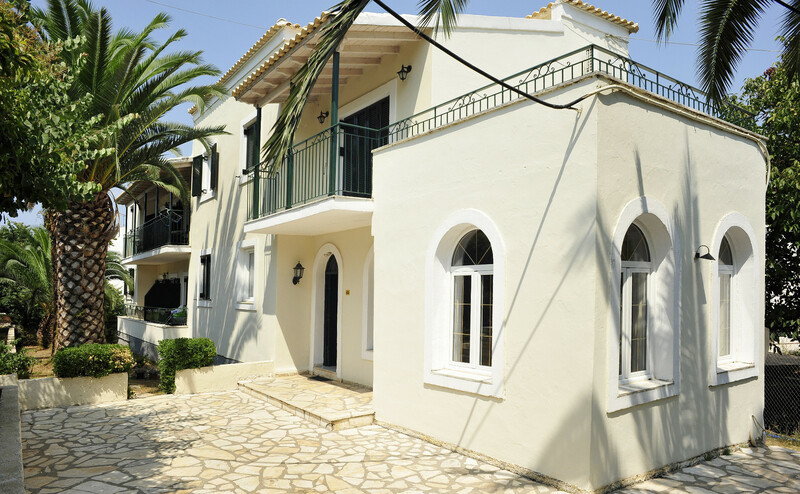 Kalamionas is the closest and most accessible. It is easily reached, either by the main road leading out of Kassiopi or by little pathways that run between the buildings that back onto the beach. There are a couple of snack bars on this beach and a nice restaurant to meet all your needs. All of these beaches are shingle but they are perfect for sunbathing and swimming. Certainly for children, plastic shoes for the sea are advised. There are also sun beds and umbrellas for hire at a small charge but well worth it. On a couple of the beaches there are also pedalloes and small canoes available for hire, which can add many hours of fun for the whole family. It is very safe all round Kassiopi for swimming but of course, especially in the case of children, the usual safety rules always apply, particularly as there are no lifeguards. Being pebbly beaches you may find occasionally that the seabed can dip down deeply and quite suddenly in some areas. There are no lifeguards on duty so it is extremely important to watch the children at all times. In this area of Corfu it can be quite windy after midday in the height of summer, and although it’s a north wind it doesn’t get cold, just very gusty. Again, children playing on lilos must be watched constantly. Whilst sitting on the beaches around Kassiopi you will regularly see in the distance large ferries on their routes to and from Italy. Quite often, about 5 – 10 minutes after they have passed a large swell will come up and send waves crashing onto the beaches. Anyone sat close to the water’s edge may well get soaked but it does add a few moments of fun in the water, especially for the children. Other Beaches Close to Kassiopi: There are several other beaches in the near vicinity worth visiting. Imerolia, to the West, is within walking distance, has a beach side taverna, is perfect for swimming and is usually one of the quieter beaches. To get to Kalamaki, further on, you will need a car. This is a great beach for the children as it is sandy and the sea is very shallow till very far out. Again, although sandy, it is advisable for children to wear beach shoes whilst in the sea. There is a restaurant and a couple of beach bars and is only about a 7-minute drive. To the east of Kassiopi, less than 2km is one of the most perfect beaches in this area. Called Avlaki, it is pebbly but the sea is crystal clear and perfect for swimming. Being a very long beach, there’s plenty of room for everyone and rarely gets very crowded. There are just two tavernas serving a wide choice of snacks and meals. It is possible to walk there, and this will take around half an hour from Kassiopi. From the far eastern end of Avlaki beach the road carries on and it is possible to either walk or drive to San Stefanos, on the east coast. Walking there will take a good half hour but it’s a short 10-minute drive by car. During the hot summer months it can be extremely hot, therefore hats, cover-ups and sun cream are a must when out walking, especially for the children, but alternatively car hire is recommended if you plan on going to beaches further away. Close to Avlaki is the beach of Coyevinas, a quiet secluded beach, particularly good for people who really want to get away from anything and anyone. There are just a scattering of beachside villas and no bars or tavernas. This area is very unspoilt and beach shoes are a must as there are quite a lot of sea urchins amongst the rocks. A short walk through the olive groves towards Kassiopi and you will pass through the bay of Soukia. This is a very small, quiet area and very good for snorkelling as there’s a lot to see between the rocks. It’s very much off the beaten track and is overlooked by a couple of very smart villas. If you walk back to Kassiopi via the track from Soukia rather than the main road it will take approximately 10 –15 minutes. Sandy Beaches Near Kassiopi: The nearest sandy beach to Kassiopi is located about a 7-minute drive west towards Roda. The beach is called Kalamaki and you will see signs for it along the main road. It has a large expanse of beach, there is a beach bar and two tavernas. A long jetty stretches out into the sea and serves the many boats that arrive daily. Umbrellas and sunbeds are available for rent along with pedalloes and canoes. Heading on in the same direction, look out for a small sign on the right for St. Spiridon. Situated not too far from Kalamaki, here you will find a lovely little sandy bay. It is ideal if you are not too keen on the larger sprawling beaches even though it can get crowded during high season, when it's wise to set out and get your place early on the beach. There are a couple of tavernas for your refreshments. Around 15 - 20 minutes from Kassiopi is the resort of Acharavi. The beach can easily be reached via any of the roads that turn right off the main road (assuming you are coming from the direction of Kassiopi). Certain parts of the beach may be slightly pebbly but most of it you will find to be sandy. It is great here for families with children as the sea stays shallow till a long way out. There are watersports here as well so it is suitable for anyone. All along the beach there are snack bars and tavernas and whilst sitting on the beach you will often find people selling donuts, ice cream and watermelon. Sidari, about 30 minutes from Kassiopi, is a lively, family resort and possesses a splendid, clean, sandy beach. Although not known for being very picturesque, it is very popular with holidaymakers and is well known for its peculiar rock formations at the western end. The most famous one is the Canal d'Αmour. Legend says that anyone who swims through this narrow channel will find the man or woman of their dreams. It is worth finding a good map which will indicate other sandy beaches on the island. Heading east from Kassiopi, down the east coast, you will find that all the beaches are pebbly. Swimming Pools in Kassiopi: There are many swimming pools in Kassiopi. One or two are for private use but many of the ones in central Kassiopi are for use by the general public. Greek people are very dubious about using swimming pools, having been brought up surrounded by the fabulous waters of the Ionian, but most pools are kept up to the health and safety standards required and people use them with no problems throughout their holidays. The usual safety rules always apply especially when it comes to the children and weak swimmers. It must be noted that no swimming pools have lifeguards on duty, so it is entirely up to everyone to keep an eye on their children for the duration of the stay around pools. The Church: One of the most notable buildings in Kassiopi is the church of the Panayia Kassopitra, which dates back to the 16th century. Beneath the church lie the remains of a temple to Jupiter Cassius, from whom Kassiopi gets its name. The church is dedicated to the Blessed Virgin Kassopitra and inside there is an icon of the Virgin and at one time was credited with having miraculous powers. For this reason Kassiopi became a place of pilgrimage long before St. Spyridon became the island’s patron saint. This beautiful church and its pretty surroundings are tucked away just off the main street on the right hand side heading down towards the harbour. The visitor often misses the entrance but in springtime is quite a sight as the pathway leading down is overhung by beautiful mauve wisteria. The church is named after its most venerated icon and it’s certainly a worthwhile place to visit. Anyone can go into the church but they do need to be dressed respectfully. Many festivals occur throughout the year, the main one of course, being Easter, during which there are many church services throughout the week and big family celebrations on Easter Sunday. On many of these occasions in Kassiopi there are festivals held outdoors, called Paniyiri, when there will be music, dancing and lambs roasted on spits. The best known one that occurs in Kassiopi is on 15th August (Assumption of the Virgin Mary), which is an important day all over Greece and anyone called Maria or Marios celebrates their Name day on this day. The Castle: In centuries gone by the Angevins were the recognized rulers of Corfu and Kassiopi’s long historic past is still evident in the shape of the 13th century fortress situated on the headland overlooking Kassiopi from all sides and across the stretch of sea towards Albania. Many visitors venture up to take a look but little remains of the original structure. The main gate is still evident and sections of the walls that encircle the entire area. Restorations are currently taking place. The Venetians finally took control of the island from the Angevins, who held out for many months before they made their last stand in Kassiopi before they surrendered in 1386.The Venetians consequently helped to maintain control over Corfu for around 4 centuries. History maintains that during the Roman period Kassiopi was an important stop along the road towards Greece and well-known Romans such as Cicero, Ptolemy and Emperor Nero passed by. The views from the top of the road that slopes down towards the village are magnificent and quite breathtaking. On clear days you can see Corfu Town in the distance and the mountains of Albania a short distance across the sea. Although just a tiny resort, it is very upmarket and there are several good tavernas and bars along the front of the harbour and many jetties jutting out from them. Overlooking San Stefanos and along the road towards Kerasia, set amongst the olive groves are many of the finest villas and properties you will find on Corfu. To really explore this part of the island it is best to hire a car as no excursions will take you along the back roads. Another picturesque place worth a visit, especially around lunchtime is the quiet, secluded bay of Agni. Up until a few years ago this beautiful bay was only accessible by boat from nearby, coastal resorts but now there is a narrow, tarmac lane which leads down from the main road at the top, not far from the village of Kentroma. At the bottom, before you get to the beach there is a small car park. Many people staying in villas around this area will go to Agni by boat to enjoy lunch or dinner, while sitting right at the water’s edge and this is great for families with children who can be watched playing in the sea and on the beach, from tavernas just a short distance away. The much-photographed, horseshoe-shaped harbour of Kouloura is a delightful spot for morning coffee or lunch and just a short distance away is Kalami, made famous by its association with the Durrell family. Thankfully, years of tourism have not spoilt these areas and they both remain lovely, curving bays overlooked by cypress-dotted hillsides. Heading Inland: The remote village of Old Perithea, set on the northern slopes of Mount Pantokrator is in the near vicinity of Kassiopi and is named after one of the many churches surrounding the area. The name literally translates as ‘around God’ or ‘holy vicinity’. For many years Old Perithea was the capital of the Kassiopi province. Time has certainly turned things around as, around 740BC, coastal settlements were frequently invaded and forced the inhabitants to move to safer regions inland. Fast forward and the residents of this ghost town eventually left to find work in the richer, coastal areas. In recent years a couple of tavernas have sprung up between the crumbling, stone houses and churches and to sit and ponder the past is a most relaxing experience. In spring, this valley is a perfect spot for naturalists who can enjoy watching many species of birds, butterflies and wildflowers. It is possible to reach the top of Mount Pantokrator via a path from Old Perithea. The climb will take at least an hour. Old Perithea is an enchanting village.